"Dogge" redirects here. For the musician, see Dogge Doggelito. For other uses, see Dog (disambiguation). Molosser is a category of solidly built, large dog breeds that all descend from the same common ancestor. The name derives from Molossia, an area of ancient Epirus, where the large shepherd dog was known as a Molossus. Molossers typically have heavy bones, pendant ears, and a relatively short and well-muscled neck, with a short, broad muzzle. Nineteenth-century army veterinarian and entomologist Jean Pierre Mégnin theorized the four basic canine races, based on his observation of their different skull structures, are: Lupoides (Spitz), Braccoides (scenthounds), Graioides (sighthounds), and Molossoides (mountain dogs, Mastiff breeds, and even Pugs). Although study of the canine genome is causing the revision of phenotype-based taxonomies such as Mégnin's, the four categories are still used in some traditional contexts. Molossers are used for a variety of jobs that require strength and size. Some molosser types are used for search and rescue dogs, such as the Newfoundland and the Saint Bernard. Some are used as guard dogs to protect property from intruders. Livestock guardian dogs live alongside livestock and offer protection against large predators and poachers. The Greater Swiss Mountain Dog and the Newfoundland have been used as cart dogs. 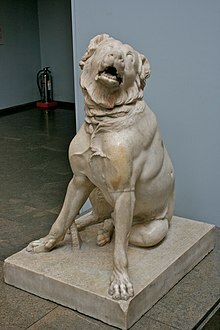 The oldest known record of a Molosser-type dog is found in its name, which is the namesake of the people who first used these dogs: Molosser is an eponym of King Molossus, the grandchild of the mighty Achilles famed in the Trojan War, who ruled the ancient tribe of Molossians in Epirus. The people of Epirus were a seafaring people and these dogs sailed with their masters to Asia, where selective breeding gave them multiple phenotypes that were better suited to their new climates and roles. As these ancient Molosser dogs were exported to West Asia, Central Asia, South Asia and North Africa, they soon adapted to their surroundings and interbred with local dogs resulting in offspring with shorter, differently colored coats, but retained more anatomical morphology traits like height and massive heads with short muzzles. The dogs were considered valuable in Babylon and are mentioned in cuneiform in the 4th century BC. A large Mastiff-like dog is shown on the ancient terra cotta by Birs Nimrud. The dog is 90 centimetres (35 in) tall at the withers and has a stocky head and powerful hind quarters. The dogs were used for hunting. Molossers were also used for military purposes and for protection. The ancient Mastiffs would later be imported from Babylon to Egypt and Asia Minor. Xerxes I of Persia led predatory wars to enlarge the borders of his empire, taking with him large war dogs in his army. Mastiffs were used to fight in the Roman amphitheater against lions and may have been used in lion hunting. They are the root of many shepherd and mountain dog breeds. The Alans kept Mastiff-like dogs taken from Eastern Europe which acted as retrievers, guard dogs and fighting dogs. The name associated with these dogs is Alaunt, or in Spanish, Alano. The Mastiffs were used in unison with sighthounds to hunt wisent, aurochs and bear. Groups of Alanian tribes came to Europe during the Migration Period, fighting on the territory of modern Portugal, Spain, France, Italy and North Africa, taking their dogs with them. The Alanian Mastiff then spread to the British Isles. The Mastiff of the Swiss Alps, the Alpine Mastiff, was a progenitor of the St. Bernard and contributed to the modern English Mastiff. The Newfoundland is the only Canadian Molosser-type dog breed. Portuguese fishermen have fished off the shores of Newfoundland for centuries and the Newfoundland was the result of Rafeiro do Alentejos crossbred with St. John's water dogs. The Bulldog breeds split from the Molossers in Europe and spread to the New World with colonization. Though smaller, Bulldogs are still considered to be Molosser breeds. In contemporary culture they are also known as Mastín (Spanish), Dogue or Dogo (Romance languages) and Dogge (Germanic).